The Mt. Laurel Municipal Utilities Authority (MUA) recently completed facility rehabilitations at two of their 41 sanitary sewer pump stations. 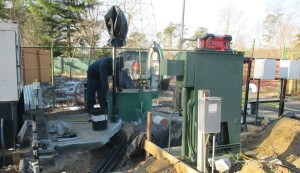 One of the pump stations is located in the Timbercrest development and services both the Rancocas Woods and Timbercrest developments. The other pump station is located in the Birchfield development and services over 2500 homes in Birchfield, Holiday Village, Spring Valley Estates and other areas near Church Road. Construction on these two pump stations commenced in August of 2015 and was expected to take approximately one year to complete. MUA Operations Engineer Bob Adler said “All electrical upgrades are now finished with the exception of a few minor punch list items, and the facilities are fully operational. The engineering firm of Alaimo Associates designed and inspected the construction, which was performed by Scalfo Electric. The cost to rehabilitate the two facilities was $315,000. The Birchfield Pump Station was originally constructed in 1970 and received a major upgrade in the 1980’s; Timbercrest Pump Station was constructed in 1978 and this is its 3rd major rehabilitation. Mt Laurel MUA has 41 sewage pumping stations servicing the town with several currently over 40 years old. Periodic rehabilitation and upgrades are performed as determined by the MUA’s Asset Management Program. Funding is provided via customer revenues and distributed through the Capital Improvement Program of the MUA. Construction work has already started on the next round of pump station rehabilitation projects, at the MUA’s Turnpike and East Park pumping stations. Those projects are estimated to cost of over $300,000.